Roasted pumpkin seeds make for an undeniably tasty fall snack! Boil your seeds in salted water, drain, toss in olive oil and bake for 10-15 minutes at 400 degrees. For a personalized twist, sprinkle with your favorite autumn spice before baking. 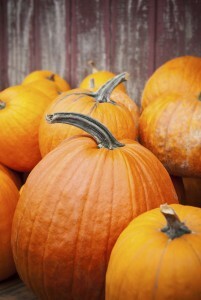 Carve an extra-large mouth on one of your pumpkins to create a sizeable opening. Come Halloween, fill your pumpkin with candy so trick-or-treaters can reach into the pumpkin’s mouth for their treats. Looking for a better-for-you use for your homemade pumpkin puree? Pumpkin protein balls are the perfect no-bake, on-the-go snack for festive fall activities. Combine pumpkin puree, nut butter, oats and coconut for a pop-able yet protein-packed treat. You can puree the flesh of your pumpkin to use in hearty breakfast breads and holiday pies, or as a rich starter for autumn soups. Simply clean out the insides of the pumpkin, slice in half and place flesh side down in a 350 degree oven for 45 minutes. Peel off the skin a toss into a food processor. Voila! Do you have a go-to trick for using up pumpkin leftovers? Tell us in the comments! Hi Karen – Please contact Customer Service at http://bit.ly/aldicustserv for more info about our meat quality. Thanks! Thank you for the ideas! Off to puree some pumpkin and freeze fir later use. More Gluten Free recipes! Love Aldi’s! Thanks, again! !